The nine-day Navratri festival that is celebrated by Indian Hindus is popularly known as Dashain in Nepal. The myth behind the celebration and the period are the same as Navratri but the method of celebration differs largely. 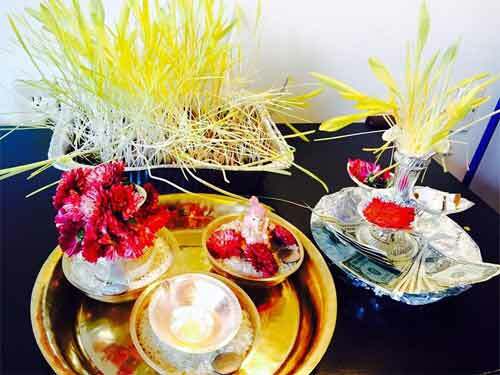 There are several unique rituals associated with Dashain. The first day of Dashain, that is the first day of Navratri, is known as Ghatasthapana. As the name indicates, a pot or kalash with an image of Goddess Durga is installed in the house on the day. The pot or kalash is filled with water and is covered with cow dung and seeds are sown on the dung. The pot is kept on a sand bed and seeds are sown on this too. Special pujas are conducted on the pot and water is sprinkled daily. The room where kalash is kept is known as Dashain Ghar. Several beds of the plant are made as they are distributed on the Vijayadashami day. By the tenth day, the seeds sown on the kalash will grow into small plants of four or five inches. This plant is known as ‘Jamara’ and is considered to be the blessing of Goddess Durga. This is distributed on the tenth day. Phoolpati the seventh day is dedicated to flowers. Families collect flowers, herbs and shrubs from forests and bring to home and are offered to Durga. On the eighth day, that is the Ashtami day, large-scale sacrifices of animals are performed. The night is also referred as Kalratri. Something that is different from the Navratri in India. In India, large-scale sacrifices are not held nowadays. The ninth day, that is the Navami day, is of great importance as the Taleju temple of Goddess Durga is opened to devotees only on this day in a year. Buffaloes and goats are sacrificed on this day too. Festivals would be far better without the animal sacrifices. But somehow people find satisfaction by sacrificing poor animals. The reason given is that Goddess Durga will be pleased by the blood. The animal sacrifice gives satisfaction to the sacrificer, not to the Goddess. The seeds sown on the kalash on the first day will grow into small plants of four or five inches by the tenth day. This plant is known as ‘Jamara’ and is considered to be the blessing of Goddess Durga. This is distributed on the tenth day as prasad to family members, friends, neighbors and relatives.